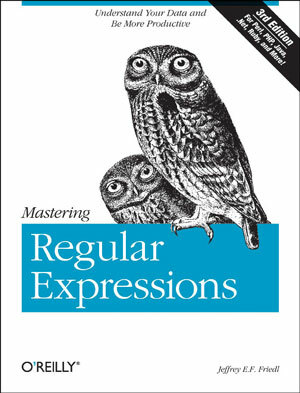 “I’ve finally finished the writing and production of the Third Edition of my book, Mastering Regular Expressions (published by O’Reilly Media). I’d been working on it since the early fall, and finished the day before my travels started earlier this month. This third edition is 58 pages longer than the second edition, and now reaches 542 pages in length. The main changes from the second edition are a new, 48-page chapter on PHP, and a rewritten/expanded Java chapter taking into account the many java.until.regex changes between Java 1.4 and Java 1.5/Java 1.6. I have to admit, I do own both first and second editions of Jeffrey’s book and I’m going to be getting his third edition too.